By Álvaro Díez - PhD candidate, Mateusz Mucha and Piotr Małek. What is a right triangle (or right-angled triangle)? The right triangle calculator will help you find the lengths of the sides of a right-angled triangle. This triangle solver will also teach you how to find the area of a right triangle as well as give plenty of information about the practical uses of a right triangle. First things first, let's explain what a right triangle is. The definition is very simple and might even seem obvious for those who already know it: a right-angled triangle is a triangle where one and only one of the angles is exactly 90°. The other two angles will clearly be smaller than the right angle because the sum of all angles in a triangle is always 180°. In a right angled triangle the sides are defined in a special way. The side opposing the right angle is always the biggest in the triangle and receives the name of "hypotenuse". The other two sides are called catheti. The relationship between the hypotenuse and each of the cathetus is a very simple one, as we will see when we will talk about Pythagoras' theorem. If all you want to calculate is the hypotenuse of a right triangle, this page and its right triangle calculator will work just fine. However, we would also recommend to use the specific tool we have developed at Omni Calculators: the hypotenuse calculator. The hypotenuse is opposite the right angle and can be solved by using the Pythagorean theorem. In a right triangle with cathetus a and b and with hypotenuse c, Pythagoras' theorem states that: a² + b² = c². To solve for c, take the square root of both sides to get c = √(b²+a²). This extension of the Pythagorean theorem can be considered as a "hypotenuse formula". A Pythagorean theorem calculator is also an excellent tool for calculating the hypotenuse. The resulting value is the value of the hypotenuse c.
As a bonus, you will get the value of the area for such a triangle. 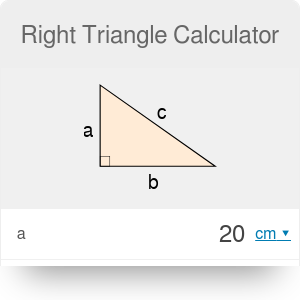 We have seen already that calculating the area of a right angle triangle is very easy with the right triangle calculator. At Omni Calculators, we have a calculator specifically designed for that purpose as well: area of a right triangle calculator. There is even one for the adventurous amongst you that would like to calculate the area of any triangle: area of a triangle calculator. Let's now see a bit more in-depth how to calculate areas of right triangles. area = (1/2)base * height. If you don't know the base or the height, you can find it using the Pythagorean theorem. Use the right triangle calculator to check your calculations or calculate the area of triangles with sides that have larger or decimal value length. So if the coordinates are (1,-6) and (4,8), the slope of the segment is (8 + 6)/(4 - 1) = 14/3. An easy way to determine if the triangle is right, and you just know the coordinates, is to see if the slopes of any two lines multiply to equal -1. If an angle is in degrees - multiply by π/180. Sometimes you may encounter a problem where two or even three side lengths are missing. In such cases, the right triangle calculator, hypotenuse calculator and method on how to find the area of a right triangle won't help. You have to use trigonometric functions to solve for these missing pieces. This can be accomplished by hand or by using the triangle calculator. The right triangle is just one of the many special triangles that exist. These triangles have one or several special characteristics that make them unique. For example, as we have seen, the right triangle has a right angle, and hence a hypotenuse, that makes it a unique kind of triangle. Aside from the right-angled triangle, there are other special triangles with interesting properties. One of the most known special triangles is the equilateral triangle, which has three equal sides and all its angles are 60°. This makes it much more simple to make a triangle solver calculator, such as the equilateral triangle calculator, in which one can calculate different parameters of such a triangle. Another of special triangles is the isosceles triangle, which has 2 sides of equal length, and hence two angles of the same size. As opposed to the equilateral triangle, isosceles triangles come in many different shapes, but all have certain properties that are exploited by the isosceles triangle calculator to obtain all the parameters of these triangles. There are many other special triangles. However, we will now take a look at a few very special right triangles that besides being right-angled triangles, they have other special properties that make them interesting. Among all the special right triangles, probably the most special is the so-called "45 45 90" triangle. This is a right-angled triangle that is also an isosceles triangle. Both its catheti are of the same length (isosceles) and it also has the peculiarity that the non-right angles are exactly half the size of the right angle that gives the name to the right triangle. This right triangle is the kind of triangle that you can obtain when you divide a square by its diagonal. That is why both catheti (sides of the square) are of equal length. For those interested in knowing more about the most special of the special right triangles, we recommend checking out the 45 45 90 triangle calculator made for this purpose. the perimeter equals a(3 + √3). It might seem at first glance that a right triangle and a parallelogram do not have anything in common. How can a triangle solver help you with understanding a parallelogram? The reality is that any parallelogram can be decomposed into 2 or more right triangles. Let's take an example of the rectangle which is the easiest one to see it. Imagine a rectangle, any rectangle. Now draw trace on one of the diagonals of this rectangle (you can learn more about this in the diagonal of a rectangle calculator). If we separate the rectangle by the diagonal, what will we obtain is two right-angled triangles. Looking at the triangles, there is no need to use the right triangle calculator to see that both are equal, so their areas will be the same. This means that the area of the rectangle is double that of each triangle. If we think about the equations, it makes sense since the area of a rectangle of sides a and b is exactly area = a * b, while for the right triangle is area = base * height / 2 which, in this case, would mean area = a * b /2. This is exactly what we already saw by just cutting the rectangle by the diagonal. It was a simple example of a rectangle, but the same applies to the area of a square. For other parallelograms, the process becomes a bit more complicated (it might involve up to 4 right triangles of different sizes), but with a bit of skill, you can use the same idea and calculate the area of a parallelogram using right-angled triangles. You can, of course, be even more efficient and just use our calculator. Geometry and polygons, especially triangles, always come together. The properties of some triangles, like right triangles, are usually interesting and shocking, even for non-mathematicians. We will now have a look at an interesting set of numbers very closely related to right-angled triangles that mathematicians love, and maybe you will too. These sets of numbers are called the Pythagorean triplets and are sets of 3 integers (let's call the a, b and c) and satisfy the Pythagorean theorem: a² + b² = c². That is, they could form a right triangle with sides of length a, b and c. The amount of numbers that satisfy this relationship is limited but mathematicians find joy in searching for new ones. Aside from the curiosity factor of this relationship, it has some interesting properties that are exploited in cryptography. Given the applications that one might find for such sets of numbers, mathematicians have explored even beyond, using 4, 5... and more sets of numbers that satisfy a similar relation in which the sum of the squares of all the numbers except for one, give the square of the number that's left. Also very connected to these Pythagorean triplets is the infamous Fermat's last theorem in which the almost legendary cryptic mathematician Pierre Fermat stated that there could not be a set of three integer numbers that would satisfy the relation: aⁿ + bⁿ = cⁿ for n bigger than 2. This conjecture has not been proven mathematically and it's considered one of the most important mathematical problems of the century. We have talked a lot about triangles, in particular, right triangles and their applications in maths and geometry. What we haven't talked about yet is the usefulness of right triangles for calculating things in real life. It might seem like the applications outside of geometry are limited, but let's have a look at shadows. Yes, shadows. The dark shade projected by an object when it is illuminated. If you were to look at the shape made by the shadow, the object, and the ground, you would notice that it, in fact, a right-angled triangle! At least it is when the object is perfectly vertical, and the ground is horizontal. Most of the time this is the case or at least close enough. This means that we can use the right triangle calculator to find different pieces of information about objects under the sun. Let's see how. Imagine that you have a building of which we want to know the height, but you cannot measure it directly because it's too high to drop a measuring tape from the top. What you can do is measure the length of the shadow on the street. Then, with the help of any angle-measuring tool and a piece of paper you can find out the angle between the shadow and the ground. Knowing that the angle between the building and the ground is 90°, you can input these data values into the right triangle side and angle calculator and obtain the value of the height of the building. Using this technique, you can measure the height of many objects as long as you have a bright sunny day or other sources of light to illuminate the object. In fact, this use to be a very common measuring technique in the olden days. Probably the most interesting and mind-blowing use of right triangles is that of Eratosthenes, who managed to use right-angled triangles and shadows to measure the radius of the Earth, and now we are gonna explain how he did it. 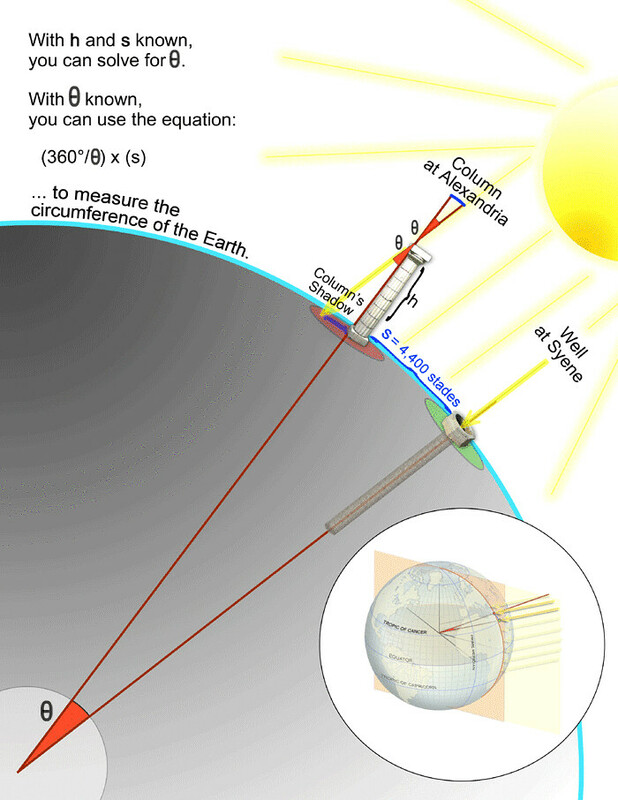 Eratosthenes noticed that on the summer solstice there was a place on Earth where the wells did not have a shadow at midday, i.e., the sun shone straight down onto them. Noting this, he set up a column of a known height at a known distance from that well and measured the size of the shadow at the same time of the day and the same day of the year in both places. Then using right-angled triangles and trigonometry, he was able to measure the angle between the two cities and also the radius of the Earth, since he knew the distance between the cities. It was quite an astonishing feat, that now you can do much more easily, by just using the Omni calculators that we have created for you. Álvaro Díez - PhD candidate, Mateusz Mucha and Piotr Małek. Right Triangle Calculator can be embedded on your website to enrich the content you wrote and make it easier for your visitors to understand your message.